This application is inspired by Material Design language developed by Google, combining a clear and consistent look. Everything within the app is happening with “meaning”: selecting and reading an article, sharing, choosing a category and many more. 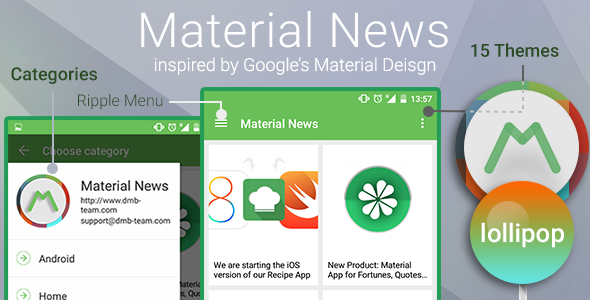 Material News will help you to convert your WordPress based website to a fully customizable Material Design based application. It has 15 predefined themes and customizable grid on the Home Screen, where you can set up how many articles per row you want to have: one, two or three. Bug fixed: When you exclude category from the menu, posts from that category are still displayed on Home screen. Bug fixed: White Screen on first load in some cases. New Feature: Indicator (hint) that more posts will be loaded when the user is at the end of the screen.